In a comment on my post about Using SSL with MySQL xiaochong zhang asked if it is possible to decode SSL/TLS encrypted MySQL traffic. The short answer is: It depends. To test this we need a MySQL server which is SSL enabled. I used MySQL Sandbox to create a sandboxed 5.6.19 server. Then I used mysslgen to create the config and the certificates. The mysslgen.py script will return a message with the changes you should make in your mysqld and client sections of the my.sandbox.cnf file. Then restart the server to make it active. For SSL to work we need to connect using TCP/IP instead of over a UNIX socket. So we connect with "./my sql -h 127.0.0.1". Now execute "\s" or "status" to see if we're indeed using SSL. Now disconnect and start the trace. First connect w/o SSL: "./my sql -h 127.0.0.1 --skip-ssl". 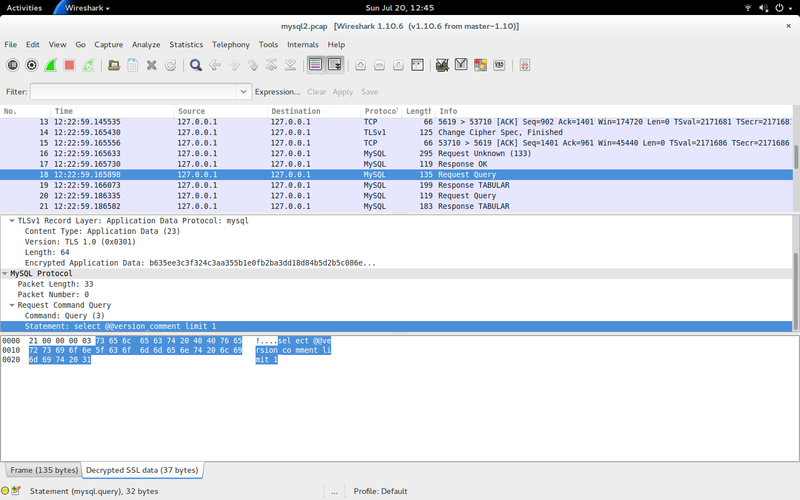 And then with SSL: "./my sql -h 127.0.0.1"
Stop the tcpdump session and start wireshark and open the mysql.pcap file. Now we can inspect the protocol. If MySQL is using the default port (3306) then wireshark will automatically decode the traffic, but now we have to use 'Decode as...' to tell wireshark this is MySQL traffic. The server greeting packet and the login request should now be visible. In the login request there are client capability flags, one of the flags indicates 'Switch to SSL after handshake' and should be set for the SSL session. Both SSL and non-SSL sessions will use the same port and start an unencrypted session. The encrypted session will switch to SSL after the handshake. This is a bit like STARTTLS for IMAP. The current version of the MySQL protocol dissector is not (yet) aware of some of the new information in the initial handshake. So the information for the authentication plugins and connection attributes is not decoded yet. The documentation about the protocol can be found in the MySQL Internals manual. This means that SHA 1 is use for the MAC part and that AES-256 is used for encryption and the keyexchange is done with DH (Diffie-Hellman). This poses a problem as DH will generate a session key, and we don't have that in the traffic dump as it's not sent over the network. We could use gdb (and maybe a debug trace?) to get the DH keys out, but for now we have an easier solution: use a different cipher suite. 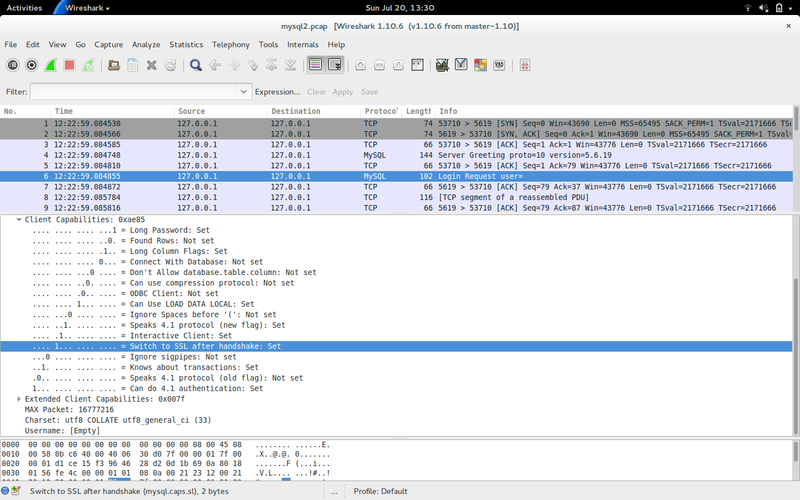 So start tcpdump again and run "./my sql -h 127.0.0.1 --ssl-cipher=AES256-SHA". This cipher uses RSA for keyexchange instead of DH. This means everything we need is send over the network or is present in the SSL certificate and/or key. Now start wireshark again and use 'Decode as...' and choose SSL. Then go Edit→Preferences→Protocols→SSL→'RSA key list' and add the server's SSL key. Now you should see the decoded traffic. The DH session key if DH is used. (you might want to read about Forward secrecy (PFS) if you're interested in the details). Oracle has released the Critical Patch Update (CPU) for July 2014. The Oracle MySQL Risk Matrix lists 10 security fixes. I don't think there is anything really important in the list, but it might be a good trigger to update to the latest release. Upgrading should be easy especially if you're using the APT or YUM repositories from Oracle. If you're upgrading to a new major release (e.g. from 5.5 to 5.6) then you should read the instructions in the reference manual. After MySQL 5.1 was released work started on MySQL 5.2, but then this was renamed to MySQL 6.0. There were many new features introduced in 6.0. But then stabilizing this branch became as huge task. Eventually the decision was made to start of with a stable branch and backport the new features from 6.0. This is how many of the 6.0 features landed in 5.5 and 5.6. So let's see which features 6.0 brought and were they landed. I'll use the What Is New in MySQL 6.0 section of the MySQL 6.0 Reference Manual for this. The Falcon storage engine. This never landed anywhere as far as I know. It's not even included in the list of storage engines in the MariaDB knowledgbase. As both InnoDB and MySQL are now part of Oracle I don't see any reason for Falcon to exist anymore. 4-byte utf8 and support for utf16 and utf32. This is included in MySQL 5.5 together with many other Unicode enhancements. Database backup with SQL. This allows you to make backups by executing 'BACKUP DATABASE' SQL statements. This is has not landed anywhere as far as I know, but some of the code might have made it into MySQL Enterprise Backup (both use backup_history and backup_progress tables in the mysql database). This might be an interesting thing to have, but with MEB there is not a real need for it. Subquery enhancements, BKA and MRR. This all made it into MySQL 5.6. LOAD XML. This made it into MySQL 5.5, but I don't think it is used often. The Maria storage engine. This is a transactional MyISAM storage egine. This is not used in Oracle MySQL. It is included in MariaDB, but renamed to Aria as it might otherwise cause confusion. As far as I known there is not much development being done on Aria. Foreign Keys. Of course MySQL supports foreign keys (now even with NDB! ), but those are implemented in the storage engine, not in the server. This was on the roadmap for 6.x but I don't know if it was actually implemented. Implementing this in the server could make writing storage engines easier and would probably also make it easier to combine partitioning and foreign keys. Did I forget any 6.x features? Did you ever try 6.x? Let me know in the comments! I was recently asked about if MySQL Enterprise Backup would be able to restore single databases. My initial answer was that this was complicated, but might be doable with the Transportable Table Space (TTS) option. But first let's go back to the basics. A common way of working with mysqldump is to get a list of databases and then loop through the databases and dump the data and schema to a SQL file. But both backups and restores will take a lot of time if the size of the database grows. And it's a luke-warm backup at best instead of a hot backup. So that's why we have MySQL Enterprise Backup. MySQL Enterprise Backup allows you to make a hot backup of InnoDB tables by copying the datafiles while watching the InnoDB redo log files. On disk the data from the InnoDB storage engine consists of a system tablespace (one of more ibdataX files), the redo log files (iblogfileX) and zero or more table-specific tablespace files (*.ibd). The data dictionary data is located in the system tablespace. This is were the tablespace number is stored for each ibd file. The redo logfiles is were the changes are written to before they are written to the datafiles. This all works fine if you use MEB to backup and restore a whole instance. Even if you stop MySQL you can't just copy a ibd file to another server and expect it to work. This is because there might be changes for that file still in the redo logfile and the table space ID in the system tablespace might not match. But you can copy a ibd file to another server if you follow the right procedure. This (partly) works with 5.5, and is greatly enhanced in 5.6.
a FLUSH TABLES..FOR EXPORT command is issued for certain tables. The tables are then read-only. The changes in the logfile are written to the ibd file and the information from the system tablespace is written to a .cfg file. Then the .ibd and .cfg files can be copied to some other location. Then the table can be unlocked. You could create a per-database backup with MEB with the --include-tables option. Then if will copy the specified tables' .ibd files and the system tablespace and the redo logs. This works, but the system tablespace might get big because of many reasons. This is where TTS comes into play. This allows you to make a backup of only the tables w/o copying the system tablespace. With the --use-tts and --include-table options I can backup all tables for one database and then restore one or more of these tables on another instance. This is without stopping the destination instance. Some per-database defaults like the default character set are stored in the db.opt file, but this file is not copied. So be aware! But what if we want to do a point-in-time recovery for just one database? That should work. First restore the database you're concerned about and then use mysqlbinlog with the --database option to restore the binlog entries which are for that specific database. I haven't use per-database (point-in-time) restores with MEB in production, but it all seems to work fine in a test setup. I've always used physical backups on a per-instance basis and then mysqldump for single-table and single-database backups. But this might be faster and the data only needs to be backupped once. Also the mysqldumps I took were not prepared for point-in-time restores as the locking required for that would block the server for too long. Please let me know your experiences in the comments.